Warning: spoilers ahead for the Game of Thrones season 7 finale. 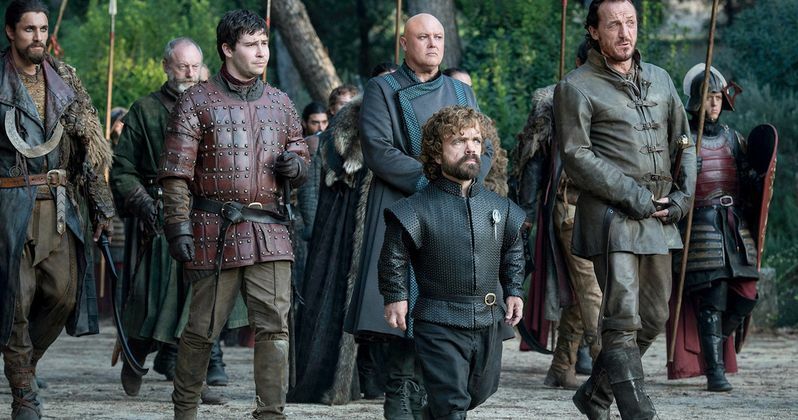 The penultimate season of Game of Thrones has come to a close and it has given fans a whole lot to think about before the show's final season debuts next year. The episode, which was appropriately titled The Dragon and the Wall, delivered on the name and also delivered something that fans have been waiting a long time to see. Now, creators David Benioff and D.B. Weiss have taken some time to talk about and explain the crazy Game of Thrones season 7 finale. Specifically, that shocking ending. David Benioff and D.B. Weiss appeared on the latest Game of Thrones: Inside the Episode to talk about The Dragon and the Wall. As we know, the Night King used the resurrected dragon Viserion to blast a massive hole through the wall. That leaves us in a very interesting place for Game of Thrones season 8. But it also runs in stark contrast to how Game of Thrones season 6 concluded. According to David Benioff, there's a good reason for that. "We try to contrast the various season endings so that they don't feel too similar. Last season we had a pretty triumphant ending with Dany finally sailing westward to Westeros. This one is definitely much more horrific. For many years now, we've known this would be the ending to the penultimate season." From the start of Game of Thrones, the wall has been a major element of the show, but there was always the horrific storm sitting just on the other side, assuming something could ever break through it. As it happens, there are massive dragons on the show that can do just that and the two finally met in this episode, resulting in what will surely be chaos for Game of Thrones season 8. D.B. Weiss explained why things went down the way they went down. "The Wall's kept these things out for 8,000 years, and there's no real reason that it can't keep doing that unless something puts a hole in the wall. There's one thing on the board from the beginning that is now big enough to do that, and that's a dragon. That just started to suggest itself as a logical way forward." Game of Thrones season 7 was shorter than usual, but it delivered in the end. There was a major death, some twists and a huge ending with major implications. Game of Thrones season 8 is only going to have six episodes, but this has certainly teed up the ball for one epic final season of HBO's biggest show. Unfortunately, we're going to have to wait a while for new episodes as it is at least going to be a year until the final seasons begins, but HBO hasn't announced a premiere date yet. You can check out the full Game of Thrones: Inside the Episode for yourself below.